Jason Johnson, an employee at Green Hill School, checks with Dr. Pope when he comes on Mondays and Wednesdays to check on inmates' health. Photo courtesy: Joyce Fink. The house is filled with the scent of simmering stew and browning rolls. A tall man cloaked in an apron hovers over the stove, preparing a meal for his grandson due home soon from school. 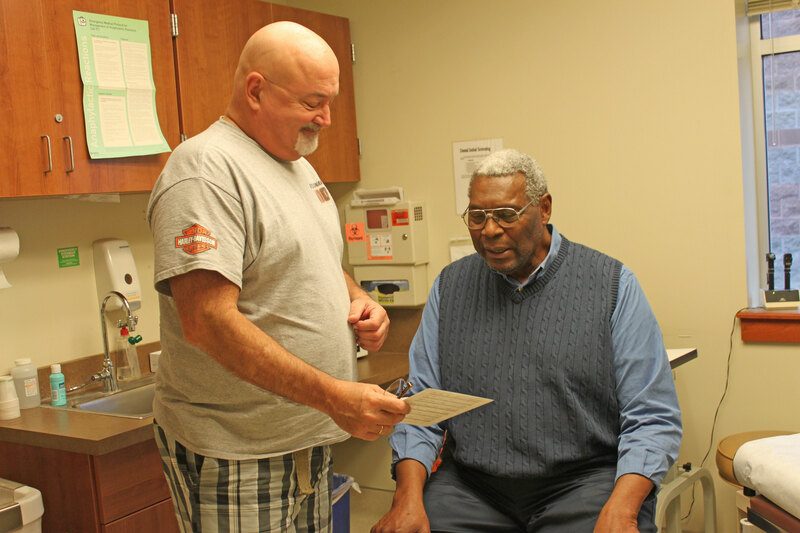 It may come as a shock to learn that the man in the kitchen is Dr. Isaac Pope, a leading pediatrician in Lewis County for twenty years. “I love to cook,” Pope says. 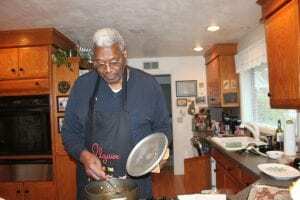 Dr. Pope stirs up a pot of stew for his grandson’s dinner. Cooking is one of his secret talents. Photo courtesy: Joyce Fink. Now nearing his 80th birthday, he confesses to enjoying bowling, swimming, slot machines and a Dairy Dan hamburger with everything on it. Other things about Pope’s life may surprise those who think they know this very public man as well. He makes no secret about growing up in rural Tennessee where segregation was a way of life. The system angered him so much that he quit 10th grade and enlisted in the Air Force. They sent him to Korea where he almost immediately he got into trouble. “I went AWOL,” Pope says. “I wanted to go home,” Pope says. The sergeant ordered him to get his bags and get back in 15 minutes. Pope was put on an airplane, given an envelope and told not to open it until he was in flight. When he opened the envelope, he learned he was reassigned to Japan. Dr. Pope ands wife, Jo, relax in their Chehalis home. The couple met in West Africa while serving in the Peace Corps. Photo courtesy: Joyce Fink. His next assignment was in Denver, where he met Mary Kirk Wilson, his “second mother.” She urged him to go back to high school, but he refused. She persisted and Pope enrolled in the Griffith Opportunity School in downtown Denver. Two weeks before school started that fall, Coach Hank Anderson called and asked Pope if he would like to play basketball for Gonzaga. “How do you know me?” Pope asked. His mother had shown newspaper clippings of him to a girl from his hometown, and she had shared them with her husband, a member of the team. Coach Anderson thought Pope would be a good fit for his team. Pope fractured his leg during his first year at Gonzaga, but they still let him keep his scholarship. Once he graduated from college, Pope taught in the Peace Corp in West Africa for two years. This is where he met his future wife, Jo. 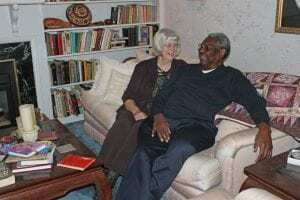 When they returned to the states, they taught in Philadelphia for a year and got married — now 51 years in duration. After that year, Pope had enough of teaching and quit. “What are you going to do now?” Jo asked him. 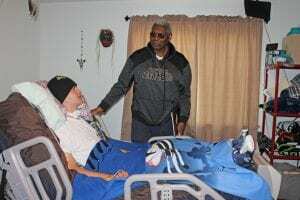 Kevin Wayne Jr., a patient at Pope’s Kids Place, greets Dr. Pope during one of his frequent visits. Photo courtesy: Joyce Fink. They took a vacation drive from Niagara Falls to Vancouver BC and, along the way, they discovered a box of mail they hadn’t read yet. In it was a letter from University of Washington recruiting Peace Corps volunteers for graduate school courses in public administration. Dr. Page stared at him as if he couldn’t believe what he had just heard. “I know I belong here,” Pope said. He gave Dr. Page some phone numbers where he could be reached once they decided to admit him. About a week later, the phone call came announcing his admission to the graduate school of public administration. Between terms, Pope worked for the Peace Corps in South Carolina. When he came back to school, his work experience counted as his thesis paper. After graduate school, the state department hired Pope for a job on the island of Panga Panga. As he packed to leave, a friend urged him to apply for medical school. Pope picked up an application and, as he turned it in, the secretary told him Dr. Schwartz in admissions wanted to talk to him. “Did you graduate from Gonzaga?” Dr. Schwartz asked him. Father Tim, as he was called, had been Pope’s mentor. “I’ll let you know in two weeks if you are admitted,” Mr. Schwartz said. Jason Johnson, an employee at Green Hill School, checks with Dr. Pope when he comes on Mondays and Wednesdays to check on inmates’ health. Photo courtesy: Joyce Fink. Dr. Pope has thrown himself into the Chehalis Children’s Clinic, Penny Playground, the Chehalis Foundation and city government. He has been a Chehalis City Councilman since 1983. He also founded Pope’s Kids Place because he saw a need for respite care in the community. He didn’t want it named after himself, but he was outvoted. He’s still an active participant in this important work. 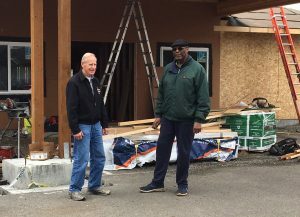 Now that he’s “retired,” Dr. Pope stays active by serving as a pediatrician at the Lewis County Juvenile Detention Facility twice a week and at Pope’s Kids Place once a week. Other acts of service are less public. Recently Dr. Pope learned of an elderly woman who couldn’t get out and socialize with her friends at the Eagles Club because she couldn’t drive and had no one to help her. Now he picks her up every Friday and takes her to the Eagles Club for a few hours with her friends.